Ruby is the eldest of Earl Blackpool’s daughters, and also the one who acts more like the son he never had than a lady. She can wield a sword and protect herself and that is the reason Lord Nyle Sheffield chooses her in marriage. He is on a secret mission for the king and needs a wife. However, three wives have died in the past few months and though it seems to be accidental he is now convinced it was murder. 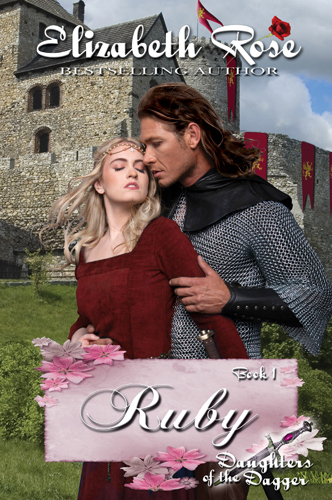 And to catch the murderer within his castle walls, he needs Ruby as bait. A wife who can hold her own if attacked, and as he finds out is a match for him as well. Lady Ruby de Burgh of Blackpool steadied her lance – the old handle off a worn broom – and rode her mare full force toward the roughly made quintain she’d constructed. Leftover broken lances she’d scavenged off the knight’s practice field were put to good use by her creative abilities. She’d constructed her own quintain of a tall post mounted on a wide base, anchored down with boulders. Atop it sat a cross-arm that swiveled when she hit it. The moist earth flew in all directions as her horse thundered over the ground, bringing her closer to her target. She raised the stick, fastened her sight on the center of the painted red and white broken shield, and pulled her arm back, ready to hit it dead center. “Ruby!” came her father’s voice from somewhere behind her. It was enough to distract her and cause her to miss her mark. The broom handle smashed into the wooden arm of the quintain instead of the shield, and she lost speed. The sandbag on the opposite side of the crossbar swung around, hitting her in the center of her back. “Ooomph!” Her breath was forced from her as the sandbag continued its revolution, but not before unseating her from her horse and landing her in the center of a huge mud puddle. “Lady Ruby, how many times do I have to tell you to stop acting like a man!” Her father, Talbot, Earl of Blackpool, stood just outside the wooden rail of the lists. Beside him stood his steward, Severin, and also a tall handsome man she’d never seen before. Ruby flipped her muddy, long blond braid over her shoulder and proudly got to her feet in ankle-deep mud. “Papa, I am not acting like a man.” She smoothed down her crumpled, torn and dirty gown, and tried to sound more mature than her age of twenty years. She knew her father was only upholding his image in front of the other men, as he’d seen her practice her version of jousting many times before and had never reprimanded her. But she’d obviously embarrassed him now at a most inappropriate moment. She knew she should act the ever-obedient daughter of an earl as was proper, but the burning desire within her to act of her own accord made her speak boldly. The deep laugh of the man standing next to her father only rattled her nerves. She didn’t see what was so amusing. Being one of four daughters of an earl was hard enough, not to mention eyebrows always lifting because of her attraction to unladylike activities. But she’d spent most her time as a child sneaking away to the armory to look at the weapons, or in the stable coaxing the stablemaster to let her ride the warhorses while mounted in a man’s saddle. She’d even cut short all her hair when she was ten and dressed like a page, joining a hunting party of men off in the woods for days. That, she had to admit was a mistake. Not only had she worried as well as infuriated her father, but she’d learned more about men’s desires and fantasies of coupling with a woman than she ever wanted to know. That alone was enough to scare her into never wanting a man as long as she lived. Most girls in her position were betrothed at an early age and already married, or even fostered out to help assure alliances with other holdings. With four girls in the family, the ability to supply decent dowries – even for an earl – became quite costly. By right, one or two of her sisters or even she, should have been sent to a convent. But luckily her father decided against it. He’d never remarried after the death of his wife, and he’d been so heartbroken to have lost her in childbirth as well as his only son, that he wanted to keep his daughters with him as long as possible to help him ease the pain. And he’d made a promise to his wife on her deathbed not to betroth any of his daughters but to allow them to find their own true loves instead. ’Twas certainly an uncommon promise for such a powerful man to make, but then again, there was nothing common about Ruby’s late mother either. When her mother was alive, she’d seen something special in Ruby, and told her that she had a good heart. She’d also told her she was the strongest of all her sisters and needed to watch over all of them and help protect them as well. Ruby had also always been her father’s favorite child. And because of this, she had never been disciplined with a heavy arm. Since her mother’s death when Ruby was only five, she tried harder than ever to make her father happy again. She’d promised her mother on her deathbed that she would always be there for her father. And she would keep that promise, and be near her father’s side always, as she never planned on leaving. Ruby picked up her soggy skirt and sloshed her mud soaked slippers across the damp earth till she met her father and his guest at the rail. “You’re Lord Sheffield?” she asked cocking her head, squinting from the sun breaking through the clouds. The summer breeze blew a loose strand of hair over her face and she swept it away with a muddy finger, leaving her cheek smudged in the process. “You’re Lady Ruby, first-born daughter of the Earl of Blackpool?” he rallied. “Father, what is the meaning of this?” she asked, feeling a sinking sensation in her chest. Sheffield’s castle was far down south and far from the coast as well. He had to have travelled at least several days in order to get here, so he wasn’t here on a social visit. She was sure that she wasn’t going to like the reason behind his arrival, as she could feel it in her bones that it wasn’t good. “Surely you’ve heard of Lord Sheffield?” asked Severin, her father’s steward who had a reputation for a wagging tongue. He’d been so quiet, Ruby almost forgot he was there. But if it wasn’t for Severin, she wouldn’t have known all the horror stories about the infamous Lord Sheffield. Severin had been telling her tales of warriors for years – her idea of a good bedtime story. That is, unless she actually had to meet one of the men of these horrific tales. This in itself was a scary feat. “Yes, I’ve heard of you,” she answered directly to Lord Sheffield, ignoring Severin altogether. “And what, my lady, have you heard?” Lord Sheffield was chuckling lowly again, his dark arrogant head cocked in amusement. His long oaken hair was well past his shoulders, and the breeze lifted it gently around his sculpted face. His eyes were a dark steel grey, and though he was grinning she couldn’t help but feel the danger that lie beneath his controlled gestures. Ruby felt her heart thumping loudly and hoped the man couldn’t hear it too. He was handsome indeed, much taller than her father, and much younger than the gossip make him out to be. Still, he was probably close to ten years her senior. She found herself thinking of the stories Severin had told her about this dangerous man just recently. Lord Sheffield hid a thousand sins behind his cool façade, and Ruby wondered how he could look so calm after all the murders he’d committed. His cloak was black, lined in satiny purple, and it reached all the way down to his feet. His tunic and hose were a slate gray, and the only piece of jewelry was the shiny gold ring on his finger that bore the crest of the Sheffields – a gryphon. She decided he reminded her of a gryphon as well. His narrowed eyes watched her every move and she felt as if he were a predator and she his prey. “I’ve heard you’ve killed off two wives,” Ruby answered, chin raised in challenge. “Lady Ruby!” exclaimed Severin in surprise. “Three now, actually.” Lord Sheffield met her challenge with a reply of his own. His silver eyes interlocked with hers in some kind of defiant battle. She felt his gaze freeze the blood in her veins, yet heat her in desire in the same instant. It wasn’t lust that stirred her passion, but rather the spar of words between them. Like her, this man was not afraid to speak his mind, or worry what circumstances would develop by his actions. This was obvious by the way he wasn’t trying to hide the fact he’d killed off three wives in the past few months. Ruby liked a challenge. She lived for a challenge. But being a woman, her life was indeed dull. And though she feared the man standing in front of her, a strange part of her welcomed his arrival at their castle after all. He obviously held some strange form of power within him to be able to make her feel this way from just a mere look. “Egads, Sheffield, why do you jest with my daughter?” scolded the earl. “Who’s jesting?” he asked, his eyes still focused on Ruby. “My third wife died only a sennight ago. Word is I poisoned her.” Sheffield’s eyes bore into her, obviously wanting a reaction. She refused to give it to him, but now that she was realizing how dangerous a man he really was, she suddenly regretted being so forward after all. “A sennight ago?” She tried to sound calm and nonchalant as if they were discussing the weather, but inside she felt her body shaking to be so close to a murderer. She only hoped he couldn’t see through her bravo.